B.I. Redux: Why I should probably avoid facebook. Why I should probably avoid facebook. 1. Llaila O. Afrika did not submit any evidence of possessing either a doctorate of medicine (MD) or a doctorate of Naturopathy (ND) from any institution. 2. Llaila Afrika attended the Technical College of the Lowcountry in Beaufort, South Carolina and received a Licensed Practical Nursing (LPN) degree in 1990. 3. Llaila Africa's LPN degree from the Technical College of the Lowcountry appears to be an associates degree. He has completed 64.30 credit hours at that institution. 4. Llaila Afrika indicated having medical experience that includes work at Dr. Otis Williams Chiropractic Clinic from 1990 through the date of his application as an employee and an instructor. He also indicated working for the Bayview Nursing Home from 1990 until the date of his application. 5. Llaila Afrika has no military medical experience indicated on his application. 6. Llaila Afrika was certified by an organization named the "International Board of African Thinkers, Traditional Priest, Priestesses, Healers and Religion, Inc." as an "Expert Holistic Health Consultant." 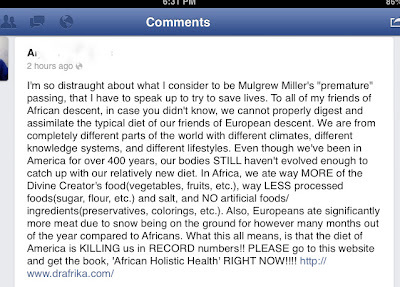 This is as closest that Afrika seems to come to being an actual nutritionist or dietician. His professional experience indicates that he taught at this organization during the same year that he was certified by it. 7. Llaila Afrika has no indication of training as an HIV/AIDS clinician. In addition to the "International Board of African Thinkers, Traditional Priest, Priestesses, Healers and Religion, Inc.," Afrika's addictionology certification comes from Life College School of Chiropractic and the American College of Addictionology and Compulsive Disorders. He acquired this certification in 1996 and it expired in 1997. He is also certified as an Acupuncture Detoxification Specialist by the National Acupuncture Detoxification Association. Afrika worked in a nursing home. 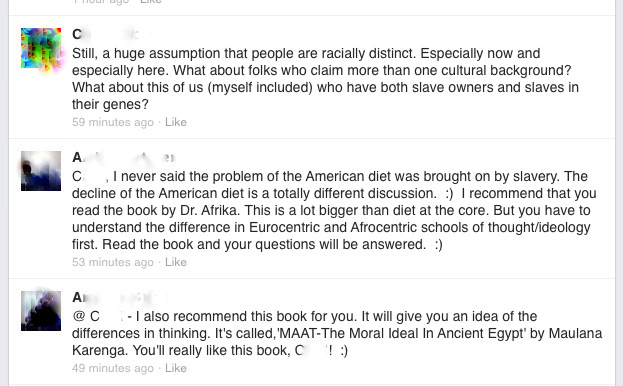 Booker concluded, "At best, Llaila Afrika is an accupuncturist that can help you shake an addiction. 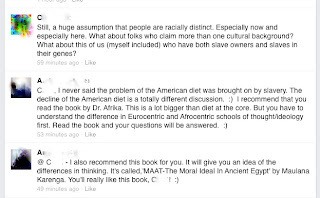 Nothing in the professional and/or academic history of "Dr. Afrika" indicates that he is qualified to speak on AIDS, diabetes, cancer, arthritis, melanin, and the various other "80 topics" that Afrika "lectures" about." 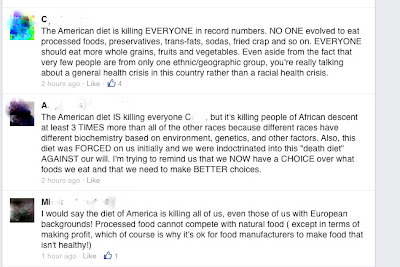 Look, I have read stats that shown disproportionate rates of diabetes among the African-American community. I wasn't arguing with that. 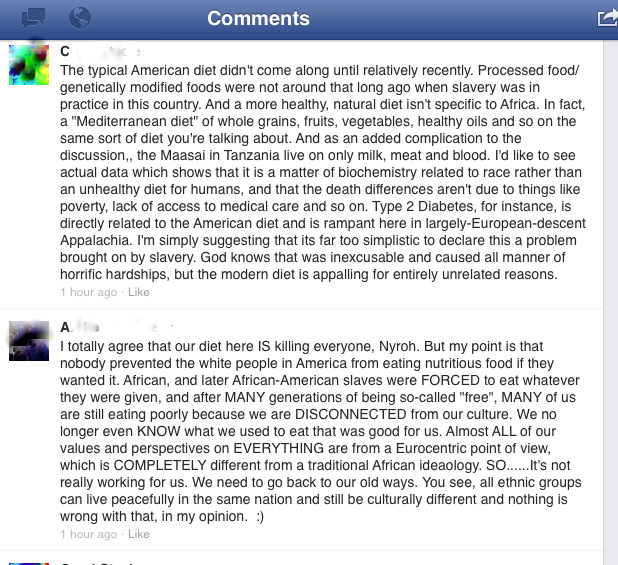 I was arguing with the unsupported notion that it is due to a genetic inability to handle a diet that NO ONE should be following. I don't like junk science, I don't like fraudulent experts, and I don't like people who parrot absurd notions based solely on their wish that they be true. 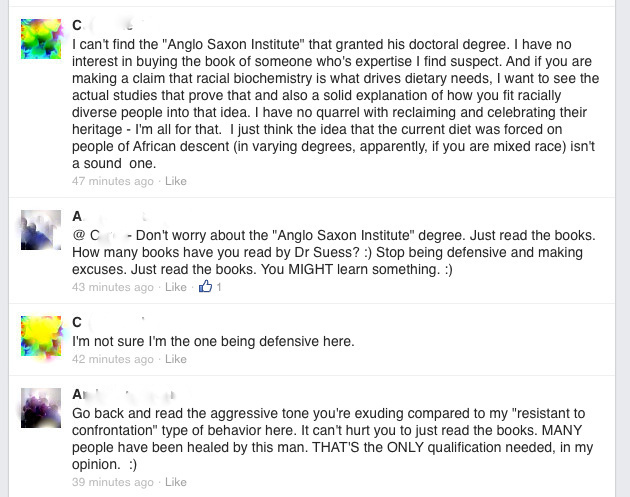 And most of all, I don't like people resorting to ad hominem attacks on me when their logic won't hold up. I de-friended the guy. Well, after reading over your exchange (three times) with this man on Facebook, I honestly can't see that you where being aggressive in your tone. You were just merely bringing up some points, which I personally feel were very valid points. Sounds to me that he just didn't care for you (or anyone) disagreeing with him. As you know from posts that I've shared, I'm not someone who needs scientific proof that something works. I will definitely read up on something before trying it out, but I don't necessarily need scientific evidence because as you know, I'm more into holistic (natural) practices rather than medical because they seem to work best on my body. So I will always try natural first. However, like you, if I feel a 'fraud vibe' or an 'uneasiness' about something or someone who claims to have a miracle cure, I go with my gut. Because even though I believe in holistic treatment, I have also met MANY people who were holistic frauds. And yes, I would want to read something about their training and background as well. So I'm very DISCERNING before I try something. 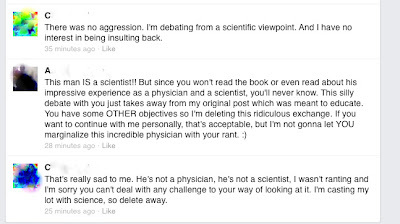 I sure wasn't feeling aggressive when I wrote it - up until the end, I thought we were discussing science. My bad. I have no problem with holistic or more traditional approaches - for instance, even though we don't really understand how acupuncture works, it does seem to help some conditions. I just don't like baseless theory being presented as fact. good for you to research and check the background. I wish more people would. Many issues today are not simple but that doesn't mean anyone should just accept the junk put out on the internet and in other media. The quacks take advantage of the many people who just don't have the time or desire to check out things. I didn't know of this one but if I see I'll remember you good post on it. I often run right to Snopes and other sources when someone sends around those email/ FB stories. They are so often not true. I didn't say anything like that. Although, I wouldn't go with "race" even in that case. Of course a particular genetic group can pass along various deficiencies. 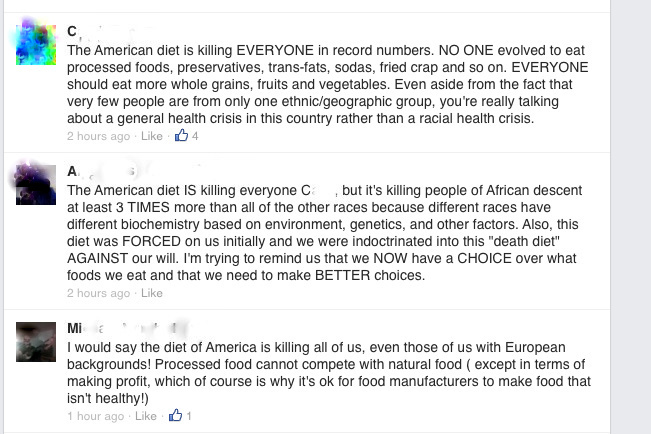 The evolution idea here was that when Africans were brought to the US, they were not prepared to adapt to a diet that didn't even exist yet. 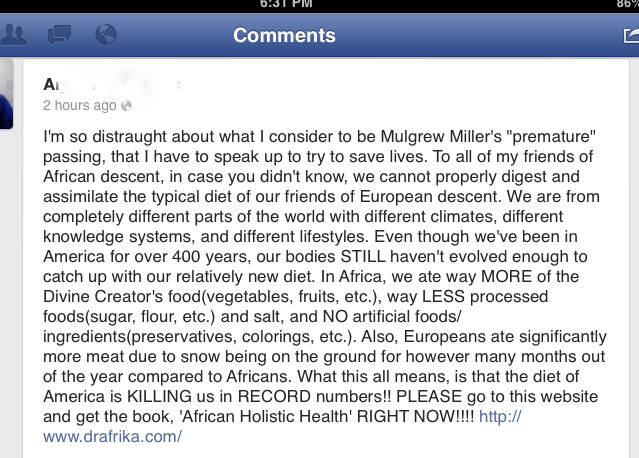 My argument is that no humans do well with the modern diet high in trans fats, preservative, GMO's, blah blah, blah. And just because there are "testimonials" on someone's website, doesn't mean it's a good idea. You can get testimonials for nearly any crackpot idea. I'm sure you know my opinion already. I think the majority of these folks are quacks, looking to make a buck. People will latch onto anything. Your FB exchange is similar to all those crazy posts people do about crime. When you provide a link from snopes disputing it, they just ignore you and continue posting their nonsense the next time. All it takes is a few converts and people start jumping on the bandwagon (to mix a metaphor). I had a friend once who got so tired of me checking his FB stories against Sopes and coming back to refute them, that the next thing he posted he said he did ONOT want to hear if Snopes proved it wrong! You're a rare one. So few people would go through the effort to actually verify and look at the claims made out by a company like this. Your "friend" is an idiot if I must say. And he calls you aggressive when he's making very condescending insinuations at the same time? His ignorance will kill him one day. I'm a Snopes fan too and go a little crazy over this outlandish claims and cures. Extraordinary how some, throwing logic and science out the door can believe such rubbish. I note he wanted to flog you the book over and over again. @ DWei, bad science is a trigger for me. And the guy was only a FB friend. 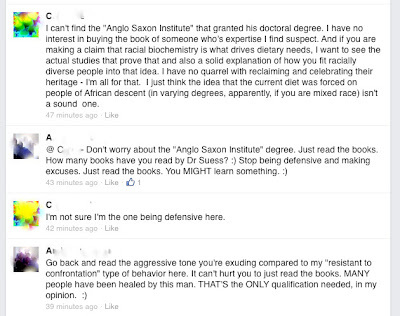 I couldn't believe he could be so openly aggressive and then call ME aggressive. @WWW, I love Snopes. Actually, I love how easy it is to get on-line and find disconfirming evidence. I am always happy to hear that something I've read isn't supported by science - I'd rather know. But not every one feels that way. I just came back and clicked on his name link......'Medical astrologist'??? Yes, that sounds very legitimate! As real as his name! I know, crazy right? How can anyone take the man seriously? Do mainstream high schools teach critical thinking? It should be mandatory, but it flies against faith-based processes I suppose. People seem to grasp at straws instead of examining ideas and theories. My dad, among others, said "Never argue with drunks or idiots". No. No they don't. But they should. And my older son always says, "Mom, why do you always argue with stupid people?" 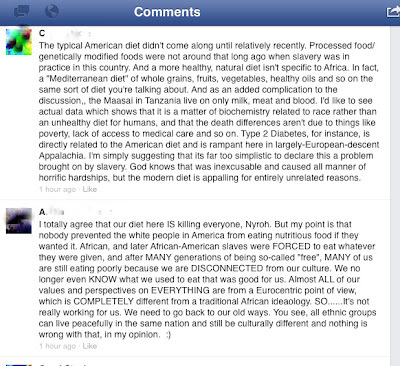 What a frustrating discussion. Well...you thought it was a discussion at the beginning. But you can't have a discussion when the other party is not even hearing you, when they are just waiting for their turn to talk. I tend to just ignore the stupid posts I see on FB. I admire that you tried to talk it over. I originally assumed he'd be open to an actual discussion. Clearly he was proselytizing and did NOT want any disagreement. I often ignore stupid posts, but this one was so blatantly misinformed I thought I'd be doing him a favor by saying so. You are right and people should not believe everything they read or see on social media or the Internet. I'm sorry it was frustrating for you and admire your efforts as well. Enjoy the weekend. If anything, people ought to be suspicious of anything they read on-line. De-friend, eat well, exercise and move on. Wasn't that funny? Like finishing with a smiley face makes you less of a prick. I laughed out loud at that inane comparison. I didn't get a chance to point out that Suess writes fiction for very young children. it's time like these i am reminded of the aphorism, "don't wrestle with a pig. you both get muddy but the pig likes it." and the author presented in the video...wow, just wow. does he also believe in a flat earth? I think that guy really believed he'd bested me. 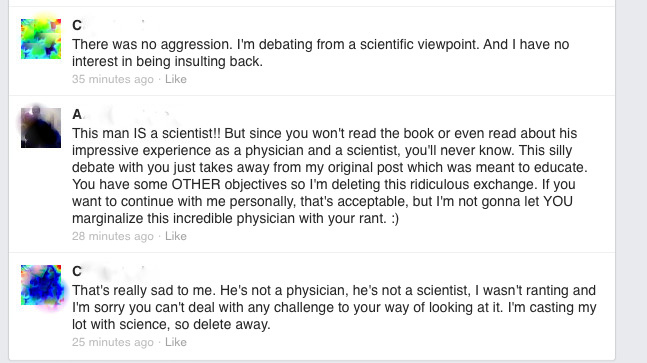 "Dr. " Young apparently believes in all manner of foolishness. i'm appalled by the small mindedness. in Malay, the word is 'geram'. i'm feeling very geram after reading this. In any language, it's unfortunate. Wordless Mellow Yellow Thursday. Or something. Doesn't feel like Mayo to ME.